And so we’re on to day 4 of our 12 Modern Lamps of Christmas. For more information on how I chose the lamps that are on this list, check out the information on Day 1. Designed by famed UK industrial designer Jasper Morrison, the Glo-Ball Mini T is the smallest member of the extensive Glo-Ball family. It’s so cute and soft-looking, it makes you wanna put it right in your pocket and carry it around. Of course, the cord and plug make that a bit difficult, but still. Glo-Ball Mini T is less than four inches around, but is still wonderfully hefty for its size. The shade is made out of thick, hand-blown opaline glass sitting on a similarly white PBT ring base. 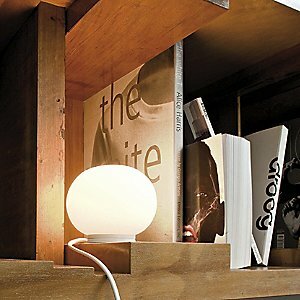 As you would expect from Flos, this little lamp is a beautiful example of contemporary lighting design. And when placed on a table or bookshelf, it provides a rich, even glow all-around (which makes me feel so warm and fuzzy that I want to cuddle with it again). You may have trouble letting this one go. But if you are able, Glo-Ball Mini T makes the perfect gift for that person with a small space and a big love of modern lighting design.